CHICAGO – Minnesota made a living in transition the last time it played Purdue and it has done the same today. The Golden Gophers have pushed the ball up the court on every opportunity and have gotten several easy baskets before the Boilermakers could get back on defense. They've also scored multiple times not on run outs, but on the secondary fast break, getting open shots before Purdue can really get its defense set. The Golden Gophers are shooting 63 percent and have been able to stay in the game because of it. Freshman center Daniel Oturu has been particularly good at beating the Boilermakers down the court, scoring nine points on 4 for 6 from the field. The good news for the Boilermakers is that their offense is playing at an incredibly high level. Carsen Edwards, who went 7 for 31 last time against Minnesota, has put together one of his better all-around performances in the first half of this one. He's been patient and hasn't hunted his own shot much at all. Minnesota continues to focus a lot of its defensive effort on stopping the junior guard and he's made some great passes after drawing a crowd on defense. Purdue's ball movement in general has been tremendous and it's a big reason the Boilermakers have only turned the ball over four times. The Boilers weren't phased in the slightest when Minnesota raced out to an early lead and settled in with a 10-0 run and five straight made baskets. They cooled off slightly as the half went on, but they were still getting good shots. Matt Haarms especially has been able to get good position close to the basket on a number of occasions and has 10 points. Purdue should keep going to that well if Minnesota can't figure out a way to stop it. The biggest positive on defense for the Boilermakers has been the job they've done against Amir Coffey. Coffey scored 54 points in the first two matchups between these teams, but has been "limited" to 10 points on six shots. Nojel Eastern has done a solid job against him one-on-one, but Purdue has also switched most screens when Coffey has the ball and is forcing him to give it up. 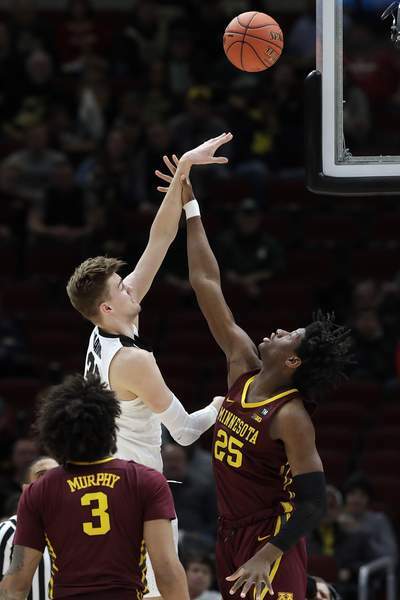 That has opened lanes for other Minnesota players, such as Gabe Kalscheur, to get open shots and the Gophers have taken advantage at times (Kalscheur has 11 points on 3-for-5 shooting from 3-point range), but the Boilers are clearly trying to make someone besides Coffey beat them. They'll take the trade-off of giving Kalscheur some open looks. As I wrote before the game, Minnesota has played Purdue tough each time this season and today has been no exception. It's been a clean, well-played game between two teams almost certainly headed to the NCAA Tournament. The Boilermakers have work to do in the second half to reach the semifinals for a second year in a row.